Hanukkah Menorah is a special candelabrum whose candles are lit up during the eight-day holiday of Hanukkah. 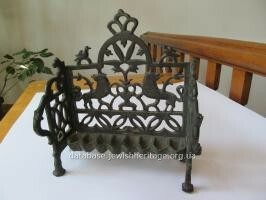 Hanukkah candelabrum made of brass in the form of a bench. 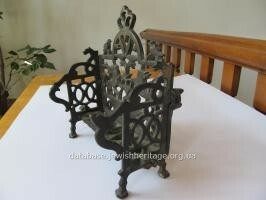 In the upper part of backrest of this chanukia candelabrum that is designed in openwork ornament there is a crown hold by two lions on the both sides. Above the lions the doves are casted on the both sides of the backrest. The main candle holders are made in the form of boats in which the special high-purified oil is poured and wicks are put. Received at the museum from a local resident in 1981. On the first day of the holiday of Hanukkah the wick of shamash and of the first candle on the right side are lit up with a special blessings. One more candle is lit up on each of the following days of the holiday of Hanukkah, till all the 9 candles will be burning on the eighth day of the holiday. It should be noted that the oil is poured and the wicks are put from the left candle holder to the right one, and the candles are lit up from the right candle holder to the left. The "servant" candle holder (shamash) is missing.